We might get a shipping date for the Windows Phone Mango update from Microsoft this week, but Joe Marini, Principal Program Manager for IE on Windows Phone, told TechRadar last week that IE9 for Windows Phone is already "code complete; we are now debugging, we are performance tuning. Graphics performance is a big focus for us right now. That, rendering compatibility, markup compatibility - any rendering issues are really getting looked at closely right now." Hardware accelerated browsing (including video, audio, text, canvas, drawing and general rendering) is one of the major improvements in IE9. When Microsoft first showed off the hardware acceleration in IE9 mobile earlier this year, it was getting 23 frames per second in Microsoft's 'speed reading' demo (compared to 11fps on Android and 2 on iPhone). "That's just what we got by the GPU acceleration being there," Marini said, before the team starting working on any performance improvements; now it's up to 27fps. There are other performance improvements since the earlier demo. "We took a holistic view of performance in the world of mobile where you have got spotty data connections or network congestion. We have a nice tiled rendering experience where as the site is coming down, we detect where a user is scrolling in the page and we provide those tiles first." That wasn't the goal. "Same markup does not mean you can mark up a site [in HTML5] and it automatically works on mobile - same markup means it should work across different platforms." With a smaller screen size and users who are more likely to be doing something specific, mobile sites work better if they're designed differently. "When you're using the web on a mobile device, it's an adjunct to what you're already doing. If I'm at the bar with my friends I might be transferring money from my savings account to my checking account so I can pay the tab but that's not the reason why I'm there. "And if I'm on the bus and there area lot of people around me I might hesitate to log in to my banking site if it dumps me straight into my account page with all this information visible; you might want to send then to an initial page that has less sensitive information." IE9 supports HTML5 audio and video for full-screen playback and background audio, though not yet videos embedded in a page, as well as canvas and SVG; it supports geolocation including GPS, ECMAScript 5 (though not the strict version which will be in IE10), CSS media queries (which automatically show a different page layout on smaller screens), the viewport tag for automatically resizing pages to the screen size, 2D CSS3 transforms, fonts, backgrounds, borders and colours. Web forms look like the rest of the Metro interface on the phone and HTML5 input types will make filling in forms easier; a page can specify if the form should contain an email address, phone number, date, time or URL and the phone will show a customised keyboard to make it easier to type. Instead of separate image files, web sites can store images as part of their HTML so they download faster; sites also get up to 5MB of local storage on the phone for caching information so you don't have to keep downloading it. There's no way for a site to ask for more than 5MB because that's not in the spec but unlike other browsers Marini says IE lets a web site check how much space it has left (if it tries to download more than there's space for the spec just produces an error). Although Adobe continues to say it's working on Flash for WP7, Marini seemed to rule out plug-ins in Mango when he talks about security for mobile browsing. "We don't do stuff like ActiveX, we don't have browser helper objects, we don't have binary plug-ins. A lot of things that were security issues, we simply didn't do on the phone - a, because we didn't need them and b, for security." Once Mango is finished, the mobile IE team will carry on working in parallel with desktop IE. 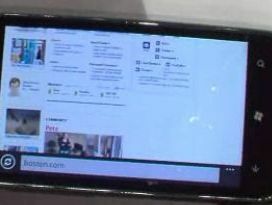 "If you play with the preview of IE10 on the desktop you can get a sense of where IE10 on Windows Phone is going to go," Marini hinted. Other future improvements might include an offline cache for web apps and ways to link between apps and web pages. "We're looking at how we can make web sites more integrated with the whole phone experience," says Marini.